This is just a short update on my Simple e4 IDE Demo. 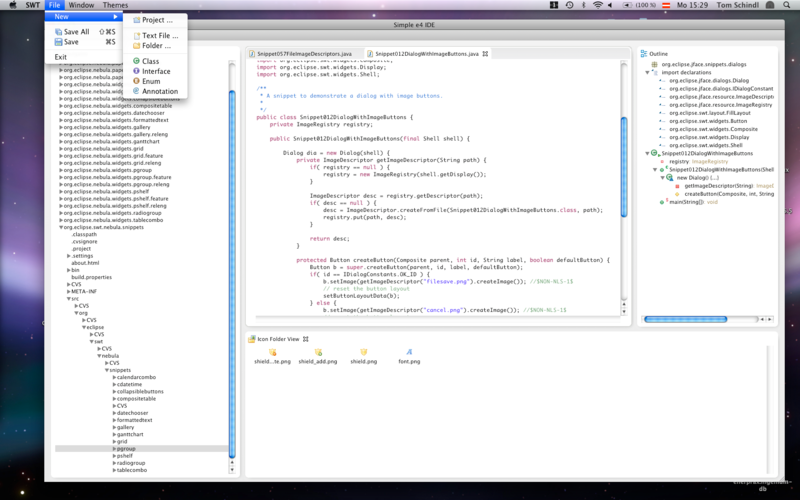 Last week I reimplemented the Outline View concept of the Eclipse IDE and ported over the JavaOutlinePage from JDT. It currently lacks selection support to jump to places in the Editor but it looks very similar to what you get with Eclipse SDKs JDT (95% of the code is equal so that’s not really a suprise). Is there a way to test this simple IDE? Or to contribute… The how to contribute section is missing from the wiki, where I have seen that many tasks are waiting for assignees, and I think I would like to take a shot. Hi, I’ll try to fill the section in the wiki. What you need is an SDK 4.0 (at least as the target) and then checking out the simpleide bundles from CVS (dev.eclipse.org:/cvsroot/eclipse/e4/org.eclipse.e4.ui/examples/*simpleide*). I welcome every help I can get. The 4.0 SDK is not available for Linux. Sad. Yes, for PPC and X86-64 architectures, not for X86. It has a test failure but that doesn’t mean it’s not available! Has the source code moved? The URL seems to be broken. And is the project further developed? Thanks.